Will an LRT Be Cheaper to Operate Than Buses? A key argument of proponents of LRT in Hamilton is that it is less costly to operate an LRT system than it is to operate a bus network of equivalent size. This is technically true, although the reality of Hamilton’s situation is not quite as cut and dry. LRT systems are both expensive to build (Capital Cost) as well as to operate and maintain (Operating and Lifecycle Costs). The savings come from ridership growth as an LRT car can grow into an LRT train towing multiple cars. Savings are then seen through reduced energy cost, reduced staff cost, (you don’t need as many drivers if the LRT is just pulling additional cars) and other costs are also reduced. This is often referred to as an economy of scale. These multiple cars can then carry more fare paying passengers, thus increasing revenue. Once a corridor reaches a certain ridership level, it can become less costly to operate higher order transit than traditional bus service on a per passenger basis. City staff, researchers, consultants, transit experts and academics all agree the LRT must have sufficient ridership to be financially viable and less expensive per passenger than a bus. Rapid Ready estimates ridership of between 1000 (at the low end) and 2000 (at the high end) peak time peak direction riders. You can read more about LRT ridership and those projections here. According to City Staff, the 95 cent figure is a typo. 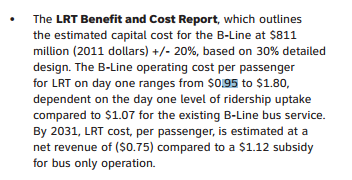 The correct cost per passenger as reported in Appendix A of the Rapid Ready Report is 45 cents. This cost per rider if achievable would make this system the least expensive system we have studied. It would appear however that staff are now distancing themselves from this number. According to staff, those numbers including the higher ridership figures are no longer believed to be accurate and are referred to as “overly optimistic” according to a recent call with our Acting Manager for Light Rail Transit. New figures are expected to be provided sometime in August or September. The highest farebox recovery rate in Canada right now is GO Transit. GO operates at a 76.2% farebox recovery ratio. The farebox recovery ratio is the amount of money paid by fairs divided by the cost to operate a service. Capital costs are not included. The TTC which has the next highest rate is 73% (as of 2014). A quick survey down a list compiled by wikipedia users shows that GO Transit actually has the highest farebox recovery rate in North America. The operating cost ratio has been drifting downwards since 2008 according to the 2014-2015 Metrolinx Annual Report. A closer look at GO Transit however shows that the farebox recovery or Operating Cost Recovery has actually fallen since 2008. This means that the subsidy required to maintain the service has increased. The subsidy has also been increasing at a time when ridership has also been increasing. GO Transit has seen their total rail ridership grow while their bus ridership has started to fall. The above is also from the 2014-2015 Metrolinx Annual Report. It is often argued that Hamilton should look to cities like Portland, Oregon in the United States to see how a successful system can be implemented. In 2001, Jonathan Richmond from Harvard University published a study titled: A whole-system approach to evaluating urban transit investments. The study which draws heavily from the Pickrell study looks at the 1989 numbers and then moves forward in time to see how some of those systems matured over the next several years. Although LRT is frequently cited as being far less costly on the O&M side vs traditional bus service – The example in Portland shows the costs are nearly the same when broken down per passenger. The costs in Portland have continued to climb over the past 16 years for both Bus and Rail passengers. This follows the trend for other transit systems in the United States and Canada. The cost per passenger has risen to $2.92 as of 2015. This is important as the Portland LRT is often referred to as an example for Hamilton to aspire to be. The costs that Portland has achieved even with their high level of ridership is nowhere near the 45 cent to $1.80 being suggested for Hamilton’s system. CityLab has provided an excellent breakdown of a 2013 study released by United States Department of Transportation. The study noted that costs to operate mass transit lines for the ten largest systems in the United States jumped 19% between 2000 and 2010. They in fact grew at double the rate of fares. A CityLab graph showing average cost per mile vs fares for the top 10 largest transit operators in the United States. The same report shows that fare recovery in the United States is falling, meaning the balance of revenue is coming from all tax payers not just those using the transit service. A CityLab graph showing farebox recovery rates have fallen in the United states over the past 10 years. Although the subsidy rates (per passenger) for public transit are high in the United States, MITL points out that we do a much better job in cost recovery in Canada. This is clear when we compare the numbers for the TTC or GO Transit to these American numbers. Even Hamilton’s HSR outperforms these results. The above chart is from the most recent (2016) Public Works budget presentation on transit. It shows an operating cost recovery of around 45% paid by the rider and 55% paid by the tax levy. The King/Main/Queenston corridor is often and accurately pointed to as the most profitable corridor on our transit line. In fact the line itself generates over a million dollars each year in revenue that goes back to the HSR to subsidize our less traveled routes. The loss of this revenue will result in a budget shortfall that will have to be made up by either an increase in taxes, or a reduction in service elsewhere on the transit system or a cutback in other city services. Negotiations are underway with Metrolinx to try and alleviate this pressure. In the 2013 Rapid Ready report the estimated operating costs of an LRT were shown based on between 1000 and 2000 riders peak time peak direction on launch day. As has been shown however, those ridership numbers may not be achieved on day one. The IBI report on Hamilton’s LRT suggested that we would only have ridership of 1800 (peak time peak direction) by 2031, a far cry from 2000 riders on launch day suggested as a possible high ridership number by Rapid Ready. As stated on the Hamilton LRT ridership analysis page, these numbers are currently being redone by a new consultant to compensate for the shorter distance of the proposed LRT but for the purposes of this page we’ll use the figures from Rapid Ready (2013) until new numbers are available. The cost of our B-Line bus service (per passenger) is $1.07). Based on these numbers alone, LRT will be more costly on a per passenger basis at the launch of the service. As stated on the ridership page, we would require an increase in ridership on the B-Line of over 450% to achieve the lowest projected passenger cost. This does not appear to be a realistic. As shown on the ridership page, most rapid transit systems built in the 70s and 80s did not achieve their ridership estimates. In fact most projections were missed by very wide margins. These estimates improved for systems built in the 90s, but how did these systems do on projecting their operating costs? 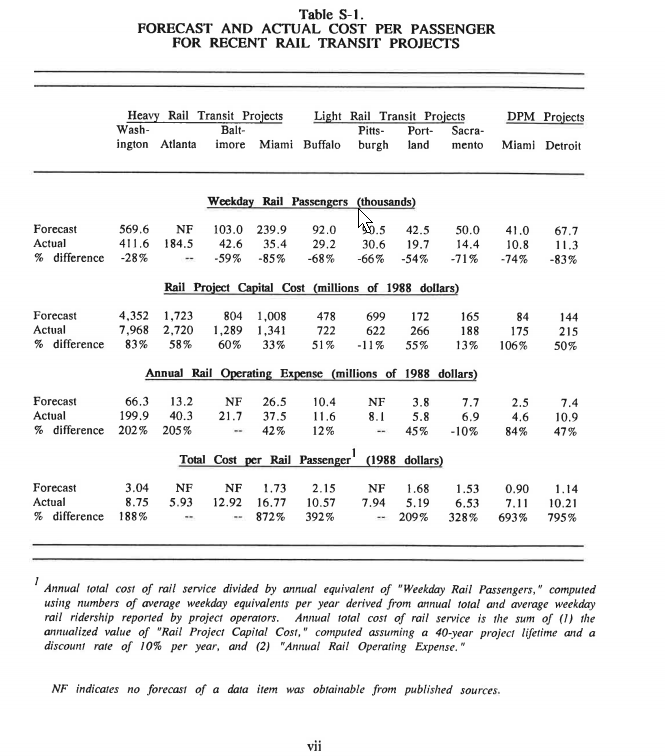 In 1989 the United States Federal Transportation Administration released a report that showed the performance of various heavy and light rail projects built during the late seventies through to the eighties. The results showed that in every case ridership projections were way off with all but one failing to even come close to their projected ridership. It also broke down the operating cost per passenger. The results from this report are startling when we see that the system that came closest to their estimated per passenger cost was off by 188%. The worst performing system was off by 872%. All numbers in the report were converted to 1988 dollars. For the Heavy Rail, Light Rail, and Downtown People Mover (DPM) systems built during this period, the per passenger cost was between 5.19 – 16.77. Projections of operating costs, adjusted for general inflationary increases in the local costs of transit operations, are being achieved. Experienced project sponsors have better O&M cost estimates. This probably reflects not only the ability to use local experience in developing unit costs but also greater realism in the assessment of efficiencies that can be achieved. The quality of ridership forecasts has improved markedly since the 1980s. While ridership forecasts have improved, several ridership forecasts reviewed in this study have proven to be optimistic. The good news is that the actual operating costs of systems are drawing closer to their initial estimates. The bad news however is that a significant number are still costing more than estimated. The 2007 report found that estimates were better for projects that were extensions to existing transit lines as opposed to new lines. This was attributed to transit systems being more mature at the time of the extension being built, as well as planners having better local real world data to use when forecasting. 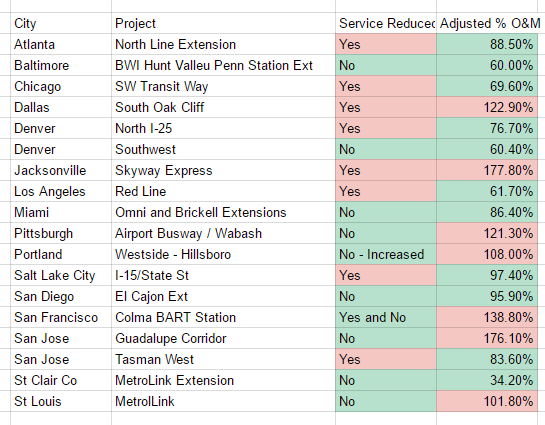 A table from the 2007 Contractor Performance Assessment Report showing 10 of 18 projects met or exceeded their operating and maintenance estimates while only 8 projects missed their estimates. It is of course good news to see operating costs below forecasted numbers however a closer look reveals that many systems actually cut service levels from their forecasted levels in order to achieve these savings. 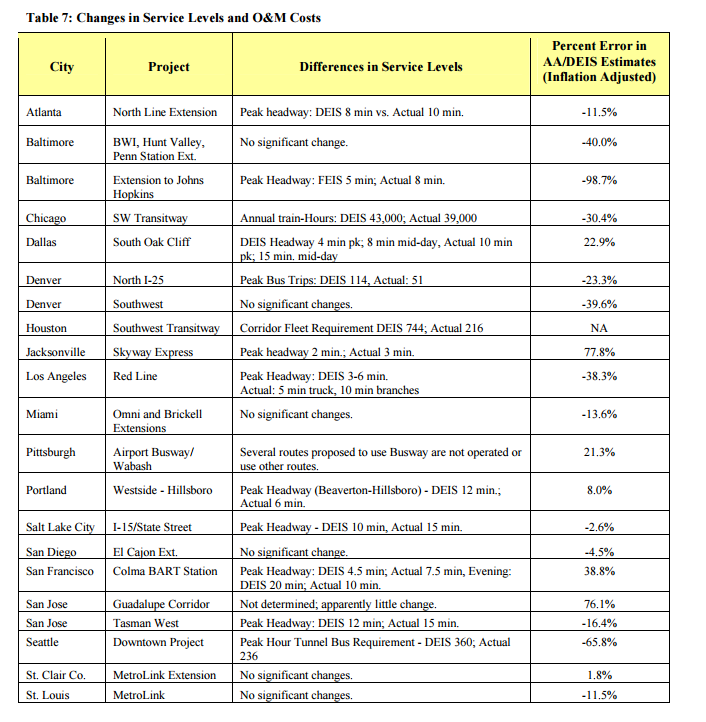 Variances from the projected operating costs and the annual operating costs can be explained in some instances by reductions in service from the proposed service levels. 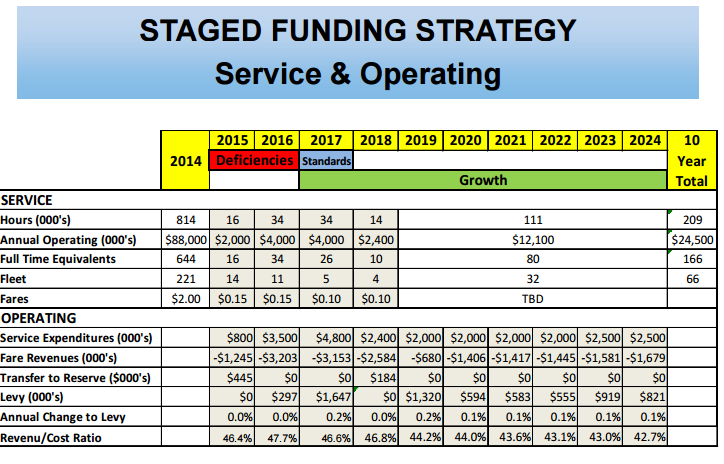 We overlaid the Forecast vs Actuals with the chart showing whether or not service was reduced from the estimated numbers to see how many of the systems met or beat their O&M budgets by cutting back service. 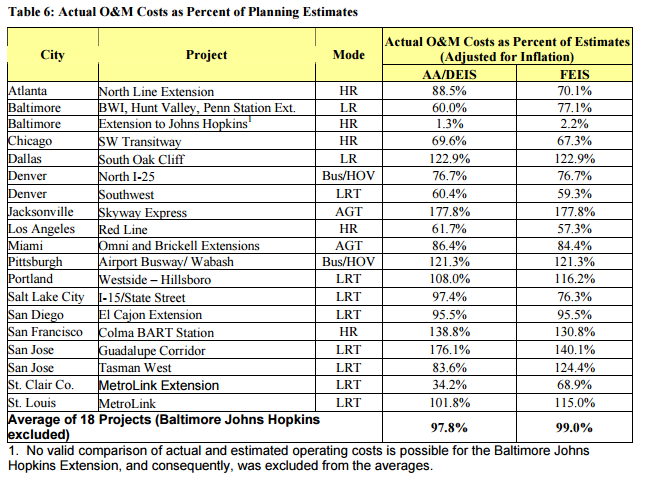 The Baltimore Johns Hopkins extension was removed from the chart as there was was no comparison to estimated vs operating costs as per Table 6. This table illustrates that of the 10 (Johns Hopkins Excluded) systems that met or exceeded their O&M budgets 6 systems provided less service than what was forecast which explains some of the savings. It should be pointed out however that Portland actually increased service from their forecasted service level which would obviously result in a higher operating cost. The FTA report also draws several conclusions about possible reasons for O&M costs being lower than forecast. “To develop an estimate of the Operating & Maintenance (O&M) costs for the planned systems, it is necessary to describe the anticipated services. This planned service level is generally consistent with the project ridership. For most projects, the design year remains in the future and the ridership is still less than anticipated. The operated service levels reflect this fact. The FTA report has several lessons for Hamilton. Forecasts on capital and operating costs while improving still experience a high percentage of errors. The average gap between forecast and actual figures for new systems is 47%. As Hamilton will likely be responsible for the operating costs for any future LRT these figures should be closely scrutinized and new high-low ranges presented. During the initial years of service, LRT is also projected to be about more expensive to operate than BRT, about 30% more on a cost per passenger basis, but the difference will diminish over time as ridership levels increase. However, it is generally accepted that LRT has a greater impact on investment decisions and economic growth than BRT, and the long term capacity of LRT is greater. This was written within the first few pages of the report and it states what most already know. The capacity of LRT is higher and therefore your per passenger operating costs will be lower when you reach sufficient ridership. IBI acknowledges that LRT will be more costly to operate than a bus system in the early days, although it does not define what the early days is at this point in the report. The question many people ask is: at what point does it become more cost effective to run LRT than BRT? How many passengers peak hour, peak direction do you need to be able to carry? IBI answers this question on the last pages of their report. The IBI report showed that by 2031 Hamilton will still be paying more per passengers on an LRT than a Bus system. 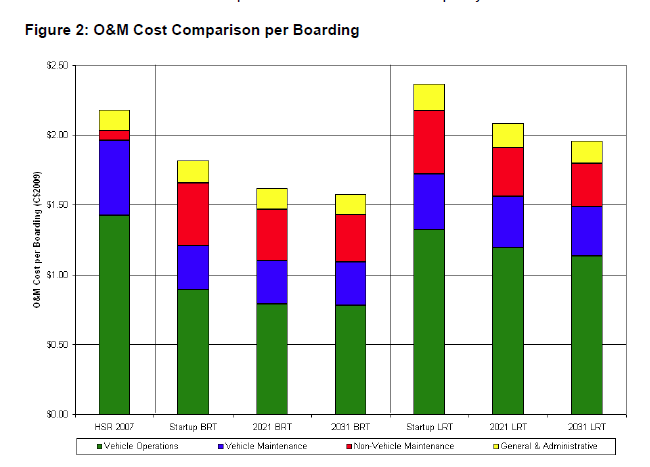 It should be noted that these comparisons do not include in any way the significant increases in annualized capital cost that LRT will have over BRT, as driven by higher vehicle costs per unit of capacity, the need to invest substantially more ‘up front’ in trackwork and traction power supply (overhead contact system), and (not unimportantly) the costs of major periodic rehabilitation of the rail-related fixed infrastructure elements. Although a ‘crossover’ point in terms of O&M costs alone might be reached within the span of a 30-year economic analysis, inclusion of the fully allocated capital costs has been found to move the true ‘crossover point’ considerably further up, to perhaps 4,000-4,500 passengers per peak hour peak direction (pphpd). The RTFS results suggest that ridership will be about 1,800 in 2031. The figures that IBI are using are suggesting that LRT does not hit the crossover point wherein putting in a dedicated BRT vs an LRT until the line hits 4000 – 4500 passengers peak time peak direction. This would represent a 900 – 1013% increase in our present B-Line ridership numbers. These figures are based on the older longer alignment from McMaster University to Eastgate Square. 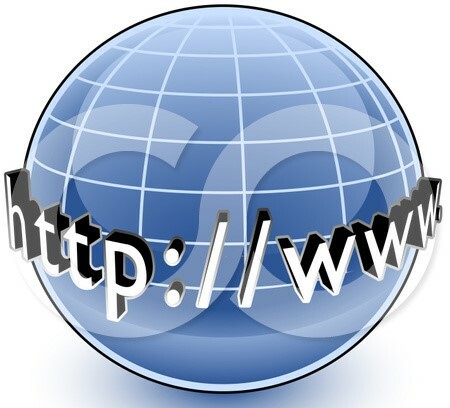 We are presently awaiting more up to date figures from City Staff and will provide them when they are available. As this route is shorter than what was used to come up with these older numbers we can expect them to be even lower.